Here, we follow Stalin’s murderous consolidation of power in the 1930s in tandem with the parallel rise of Hitler in Germany. Kotkin (History and International Affairs/Princeton Univ. 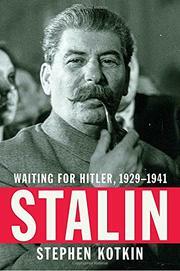 ; Stalin: Paradoxes of Power, 1878-1928, 2014, etc.) begins with an eerie literary portrait of a rather ordinary man suffering some physical deformities that made him self-conscious; he also displayed coarse manners from his peasant Georgian upbringing and voracious reading habits that drove him always to “better” himself. By 1929, this former seminarian and revolutionary had replaced God with the Marxist-Leninist doctrine and taken the helm of the Soviet state by both chance (“the unexpected early death of Lenin”) and “aptitude,” encapsulating his own personal paranoia within the country’s sense of “capitalist encirclement.” Building an entirely new world through class struggle and socialism was his historical mission, and he would achieve this through whatever means were required. His plan of forced wholesale collectivization involved the liquidation of the kulaks as a class: “These are the inevitable ‘costs’ of revolution,” he wrote in a letter to Maxim Gorky. The drought and severe food shortages of 1931-1933 caused mass flight and the starvation of millions, rendering the country vulnerable to Japanese invasion. By 1937, Stalin’s “obsession with menace,” both domestically and externally, spurred the Great Terror: mass arrests, show trials of “Trotskyites,” and murders of “enemies” far and wide, including the purge of his inner circle and officer corps. Kotkin emphasizes that there was no “dynamic” urging Stalin on, save his own plan “to approve quota-driven eradication of entire categories of people.” He left his military purged of experienced officers and completely unprepared for Hitler’s advance. In this monumental work of research, the author chillingly depicts Stalin’s methodical, “lucidly strategic” rise to murderous despot. A well-written, finely detailed installment in a definitive biography—sure to receive many prize nominations this year.